You shouldn’t transmit encryption keys over Bluetooth, but that’s exactly what some popular wireless-enabled microcontrollers are already doing. This is the idea behind Screaming Channels, an exploit published by researchers at EUERCOM, and will be a talk at Black Hat next week. So far, the researchers have investigated side-channel attacks on Bluetooth-enabled microcontrollers, allowing them to extract tinyAES keys from up to 10 meters away in controlled environments. A PDF of the paper is available and all the relevant code is available on GitHub. 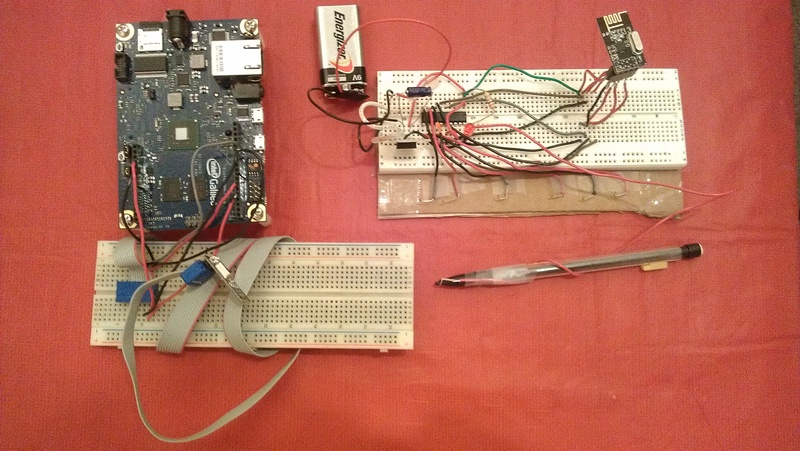 The experimental setup for this exploit consisted of a BLE Nano, a breakout board for a Nordic nRF52832 Bluetooth microcontroller, a Hack RF, a USRB N210 software defined radio from Ettus, and a few high-gain antennas and LNAs. The example attack relies on installing firmware on the BLE Nano that runs through a few loops and encrypts something with tinyAES. Through very careful analysis of the RF spectrum, the AES keys can be extracted from the ether. Side channel attacks have received a bit more popularity over recent years. What was once limited to Three Letter Agency-level Van Eck phreaking can now be done inexpensively and in a system with devices like the ChipWhisperer. Of course, this is only a demonstration of what is possible with side-channel attacks in a highly controlled environment with a significant amount of work gone into the firmware running on the microcontroller. This isn’t evidence that balaclava-wearing hackers are sniffing your phone from across the parking lot to get the password to your Instagram account, but it does show what is possible with relatively cheap, off-the-shelf hardware. Getting cryptography right isn’t easy, and it’s a lot worse on constrained devices like microcontrollers. RAM is usually the bottleneck — you will smash your stack computing a SHA-2 hash on an AVR — but other resources like computing power and flash code storage space are also at a premium. Trimming down a standard algorithm to work within these constraints opens up the Pandora’s box of implementation-specific flaws. NIST stepped up to the plate, starting a lightweight cryptography project in 2013 which has now come out with a first report, and here it is as a PDF. The project is ongoing, so don’t expect a how-to guide. Indeed, most of the report is a description of the problems with crypto on small devices. Given the state of IoT security, just defining the problem is a huge contribution. Still, there are some concrete recommendations. Here are some spoilers. For encryption, they recommend a trimmed-down version of AES-128, which is a well-tested block cipher on the big machines. For message authentication, they’re happy with Galois/Counter Mode and AES-128. I was most interested in hashing, and came away disappointed; the conclusion is that the SHA-2 and SHA-3 families simply require too much state (and RAM) and they make no recommendation, leaving you to pick among less-known functions: check out PHOTON or SPONGENT, and they’re still being actively researched. If you think small-device security is easy, read through the 22-question checklist that starts on page twelve. And if you’re looking for a good starting point to read up on the state of the art, the bibliography is extensive. Your tax dollars at work. Thanks, NIST! And thanks [acs] for the tip! [Blancmange] built a custom door chime using an ATtiny85. Unlike most commercial products out there, this one actually tries to be secure, using AES-CMAC for message signing. The hardware is pretty simple, and a protoboard layout is shown in the image above. It uses the ATtiny85 for control, with an LM380N audio amplifier, and a low cost 315 MHz receiver. The more impressive part of the build is the firmware. Using AVR assembly, [Blancmange] managed to fit everything into the 8 Kbytes of flash on the ATtiny85. This includes an implementation of AES-CMAC, an AES cypher based message authentication code. The transmitting device signs the request with a key shared between both devices, and the receiver verifies that the message is from a trusted transmitter. Fortunately, the assembly code is very well commented. If you’ve ever wanted to take a look into some complex ASM assembly, this is a great project to check out. The source code has been released into the public domain, so the rest of us can implement crypto on this cheap microcontroller with much less effort. Since the Hackaday community started working on our offline password keeper, Mooltipass, we’ve received several similar projects in our tips line. 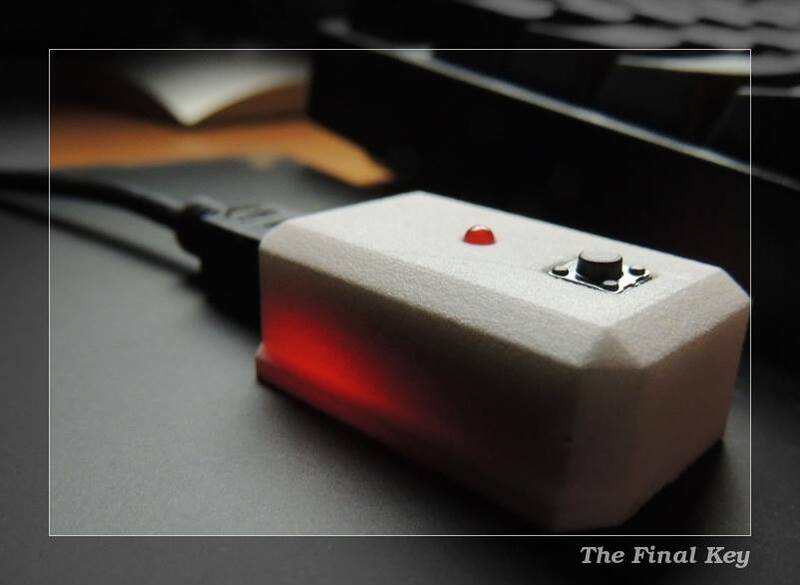 The Final Key may be the most professional looking one yet. Similarly to the Mooltipass, it is based on an Atmel ATMega32U4 but only includes one button and one LED, all enclosed in a 3D printed case. The Final Key is connected to the host computer via USB and is enumerated as a composite Communication Device / HID Keyboard, requiring windows-based devices to install drivers. AES-256 encrypted passwords are stored on the device and can only be accessed once the button has been pressed and the correct 256 bit password has been presented through the command line interface. Credentials management and access is also done through the latter. Unfortunately, the Arduino source code can’t be found on [cyberstalker]’s website, so if you see interesting features that you would like to be integrated in Mooltipass you may send us a message to our Google Group.